NOW: In order to reveal more of the historical subject, including Guggenheim Hall, Jean Sherrard moved his prospect to the south (left) and sites along Benton Lane into the older campus through some of the campuses more recent but equally brick additions. Appearing first in The Times for Wednesday, Jan. 30, 1946, this press photo was captioned, “First of 24 new housing units, these dormitories are shown being settled on their new foundations on the UW campus between Engineering Hall and Frosh Pond.” Last Sunday’s “units” for the married vets of Lake Union Village were shipped by rail from Richland. 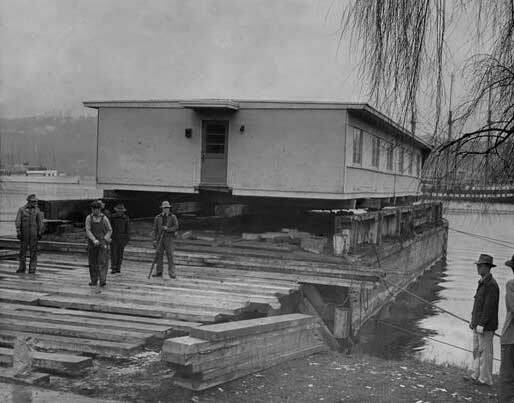 These were readily barged from Renton, up the Cedar River and Lake Washington to the edge of campus, from where they were carefully hauled on trailers to here near the center of campus. Frosh Pond housing from Renton reaches the U.W. campus by barge. Judging from a 1946 aerial photograph the two units seen here to the rear have found their proper footprints, while the unit in the foreground still awaits its last move. The 24 units can be easily counted in the same aerial, assembled into four parts as regular as arms at the top of a telephone pole. 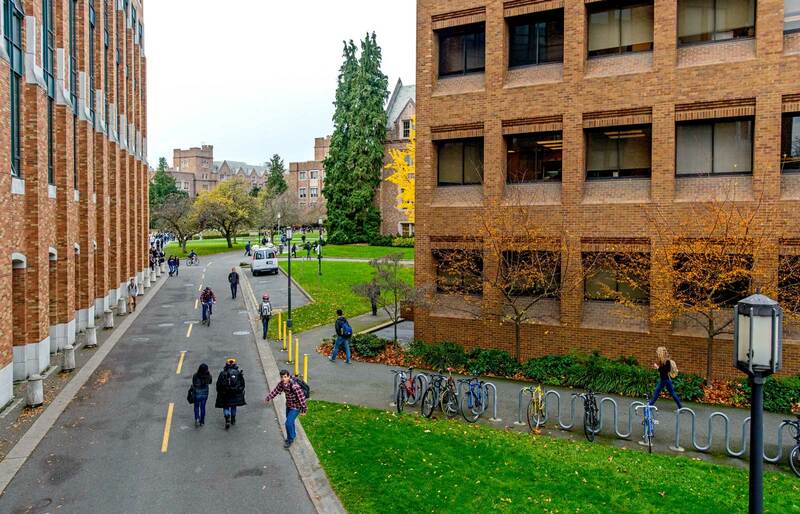 Squeezed as they were between the permanent brick Guggenheim, Johnson and Physics halls, they successfully disrupted the collegiate Gothic temper of the university’s churchly campus. Thankfully, the five dorms were temporary, although thru their mere seven years the prefabricated dorms were absurdly named with the grand but regionally routine tags Chelan, Rainier, Olympia, Cascade and Baker Halls. The Guggenheim in 1959 by Robert Bradley, where once nestled many of the temporary dormitories constructed on campus in 1946. 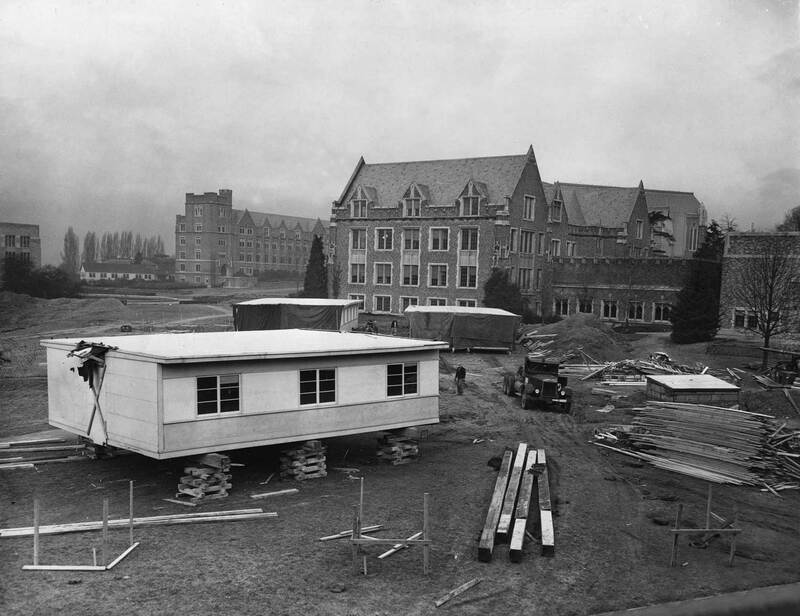 Pacific readers are invited to explore on-line the 1946 campus with its temporary prefabricated dormitory crush. The noted aerial is generously featured near the top of the blog that is regularly listed at the base of this feature. There you will also readily find the timely narrative noted and quoted last week, Richard Berner’s “Seattle Transformed,” our city’s history through World War 2 and well into the Cold War. Ron also has a sizable collection of aerials of the campus and has included a selection of those. At least two them show the “Frosh Pond Housing” from the sky. And I’ll look about for other illustrations and/or features that circle the Pond where once upon a time Freshmen were baptized. 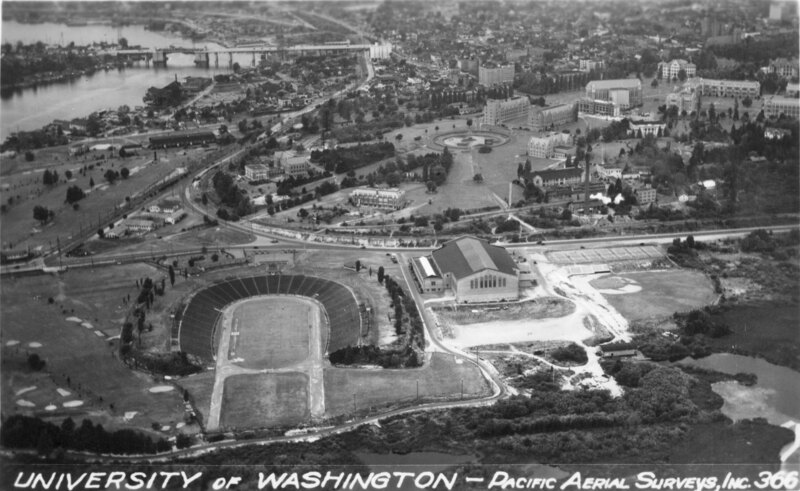 1909 Panorama of Portage Bay and Capitol Hill shot from the AYP’s tethered balloon. Lake Washington is on the far left, the Latona Bridge, far right. 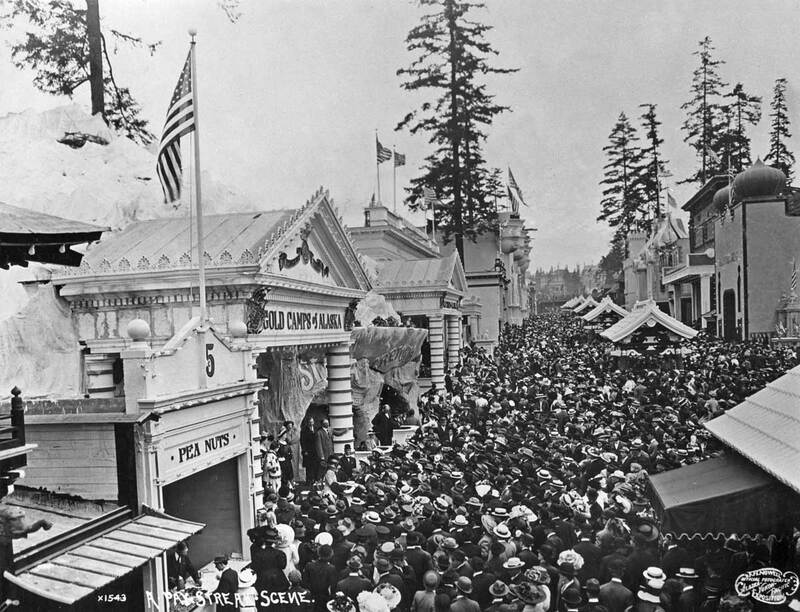 Bottom right the Seattle and International Tracks (originally the Seattle Lake Shore and Eastern Railroad and now the Burke Gilman Trail) run thru the fair and north of the AYP’s carnival, the Pay Streak. 1923 is our circa date for this view to the east. The University Bridge is bottom right. Here it still leads to its old trolley and vehicular access to the campus on 40th Avenue. The Campus Parkway is a thing of the future. 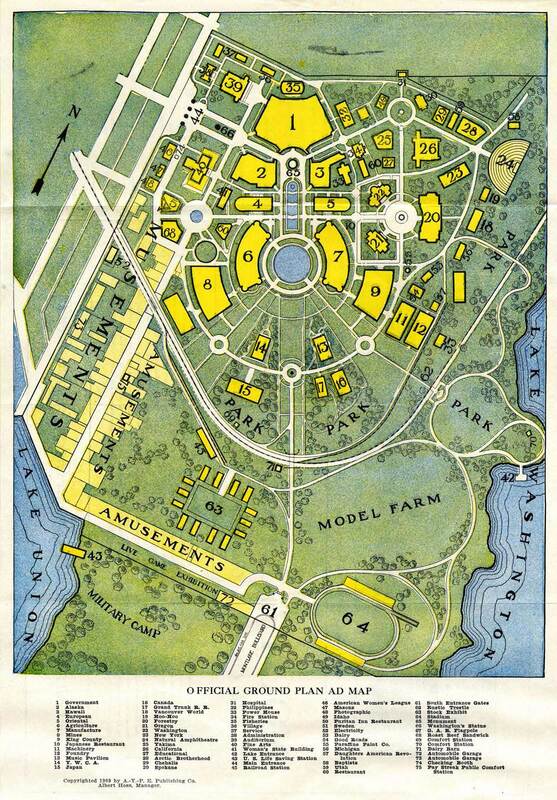 1937: Note the nurseries upper right, future acres for University Village. (This one is for you – date it!) Clues include work on the east wing of the Suzzallo Library, upper-right. The University Bridge, upper-left, shows it modern profile with the concrete piers that replaced the original wooden ones in 1932/33. ca. 1947 with the new U.W. Hospital at the center, but still to the upper-left some of the golf course it uprooted. Frosh Pond peeks from behind the seaplane’s pontoon – it seems. Ron Edge dates the above and below, circa 1946/47. 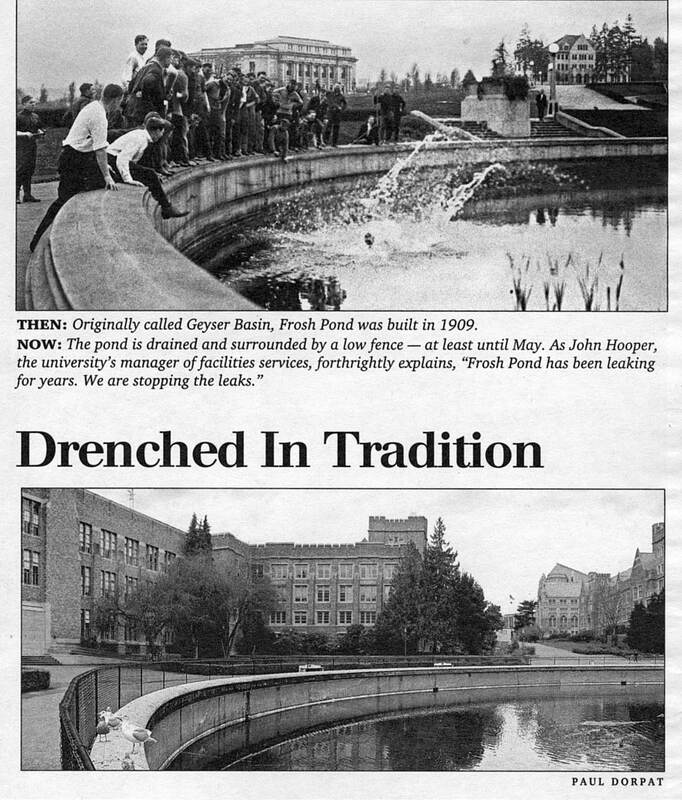 Both include the 1946 Frosh Pond housing. 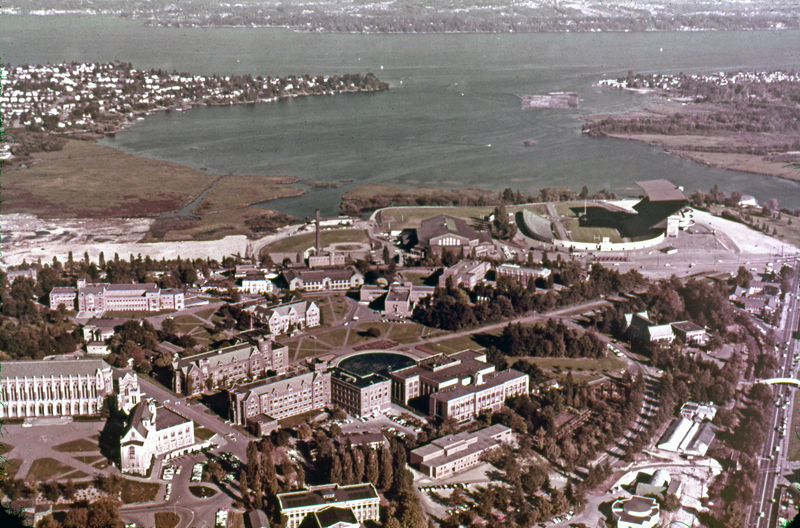 Above and below, both showing the Frosh Pond housing as well as Union Bay Village – the vets’ housing featured last week. 1958 above – and you can find the 1957 contribution to the University Village. Ron claims that you can blow this one up and find the Burgermaster. Jack Corsaw – and three others – featured in the Seattle Times for June 21, 1946, above. I knew Jack – met him in his Pike Place Market studio in 1967. A man of considerable zest, often eccentric. Among other achievements, he designed the Post-Intelligencer globe that sat on the paper’s roof throughout its residence at 6th and Wall. Jack wanted to include an apartment for himself inside the globe, but P-I management edited him out. Earlier Jack was living at the top of the Smith Tower during the big 1949 earthquake. For one of his best short stories he recounted the strange behavior of his pet canary prelude to the tremors. 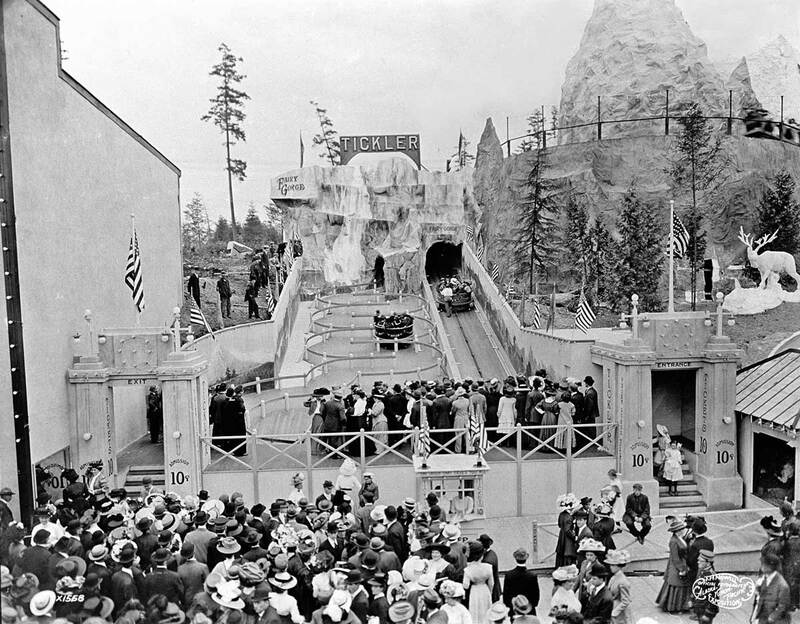 By campus lore the baptismal potential of the Alaska Yukon Pacific Exposition’s Geyser Basin was discovered soon after “Seattle’s first world’s fair” closed in the fall of 1909. A gang of sophisticated sophomores corralled a few naïve freshmen grazing on the lawn in front of Denny Hall and after some serious deliberation threw them into the circular pond that is now one of the very few surviving artifacts from the AYPE. Thereafter Geyser Basin became Frosh Pond. students launched about a dozen faculty into the pond en masse – or nearly. One of the lecturers prudently jumped in voluntarily. Stupey, who on his birthday, a freezing Dec. 10 1960, was dragged by “friends” from his warm bed in Lander Hall at 5:30 A. M., carried to the pond and tossed on the count of three. Reaching the pond Stupey first broke through the ice and a moment later lost his pajama bottoms on the bottom. profoundly, “The purpose of the fountain is decorative. The fountain itself is not a swimming pool.” What were they thinking? An early map for the Alaska Yukon Pacific Expo on the U.W. 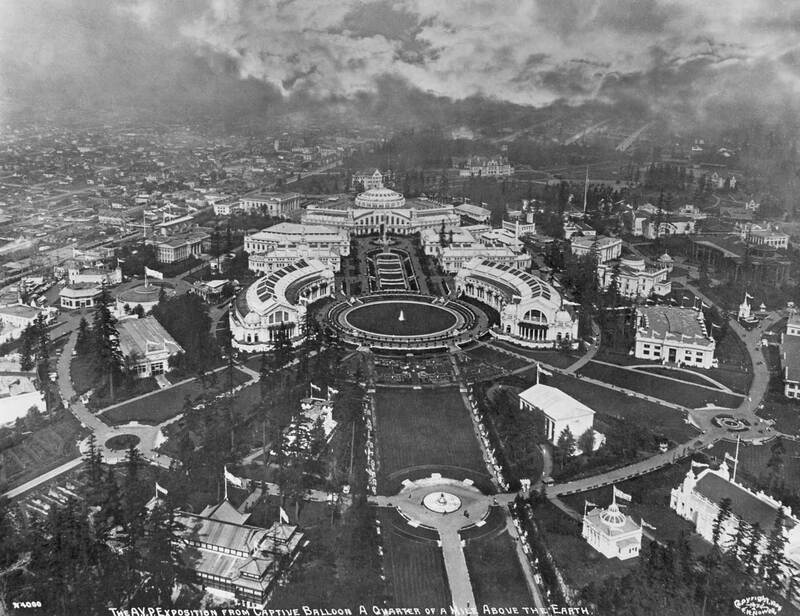 campus in 1909. 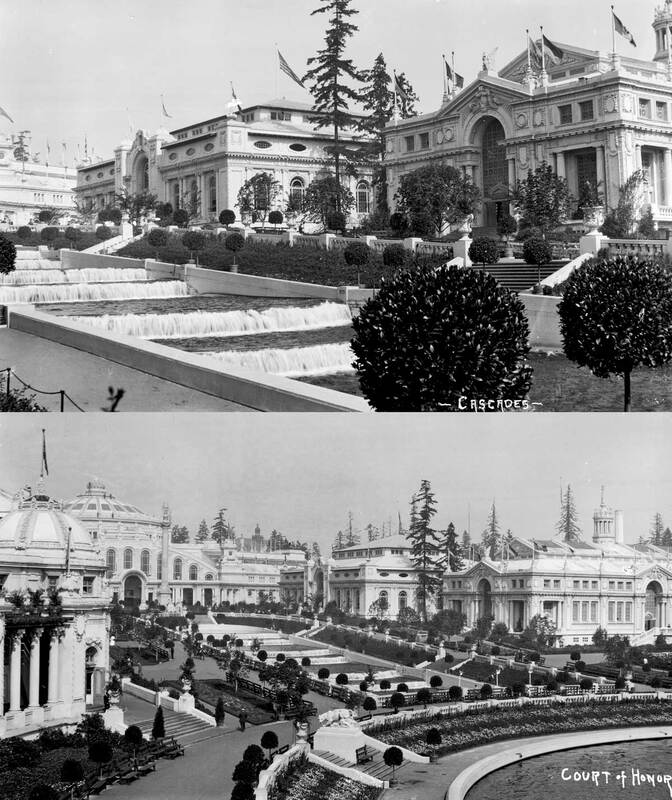 Above are six of the seven primary structures surrounding the Cascades of the Arctic Circle at the 1909 Alaska Yukon Pacific Expo., Seattle’s “first worlds fair” which also helped develop the University of Washington’s “Interlaken Campus.” Below – the left – is the seventh building, the one devoted to Agriculture. The long-time north end photographer named Price recorded this subject. 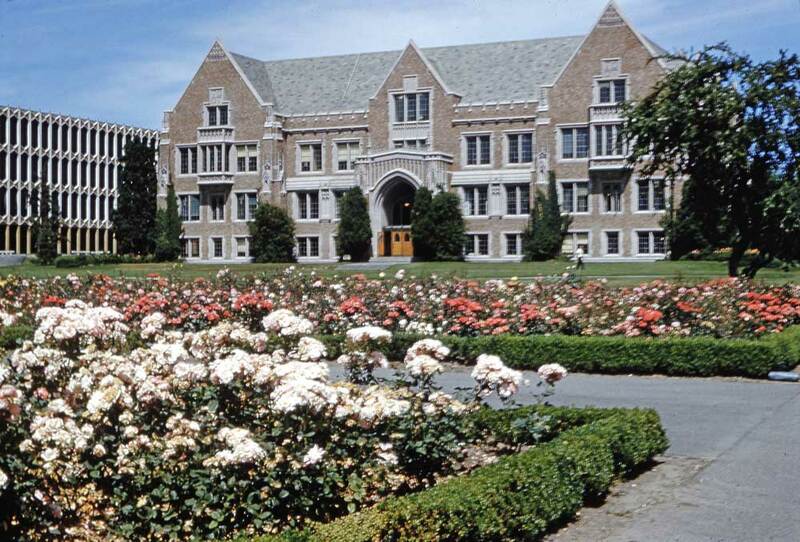 In1907, a decade after the first rush north for gold, workers started transforming the still in many places wild University of Washington campus into a civilized stage. Seattle was ready to celebrate its success in outfitting and exploiting Alaska and the Yukon, and it hoped Asia would join the list. 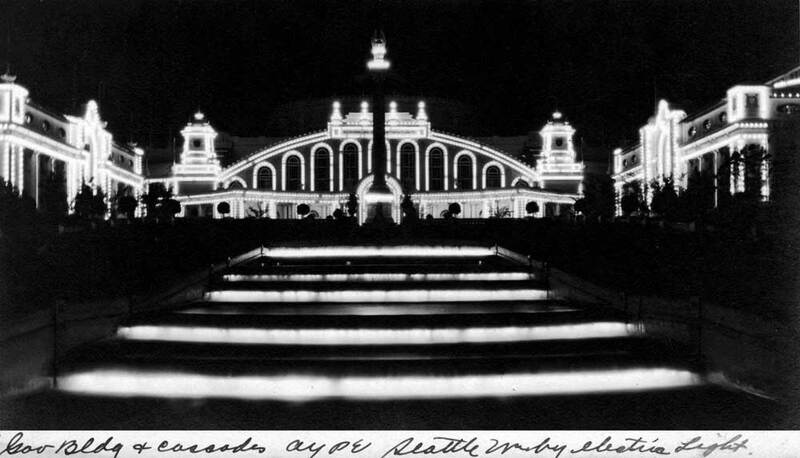 When the Alaska Yukon and Pacific Exposition (AYP) opened on Jun 6,1909, the centerpiece was the Arctic Circle, shown at the top in a photograph by Frank Nowell, the AYP’s official photographer. Here a semicircle of seven structures surrounded the Cascades and Geyser Basin. 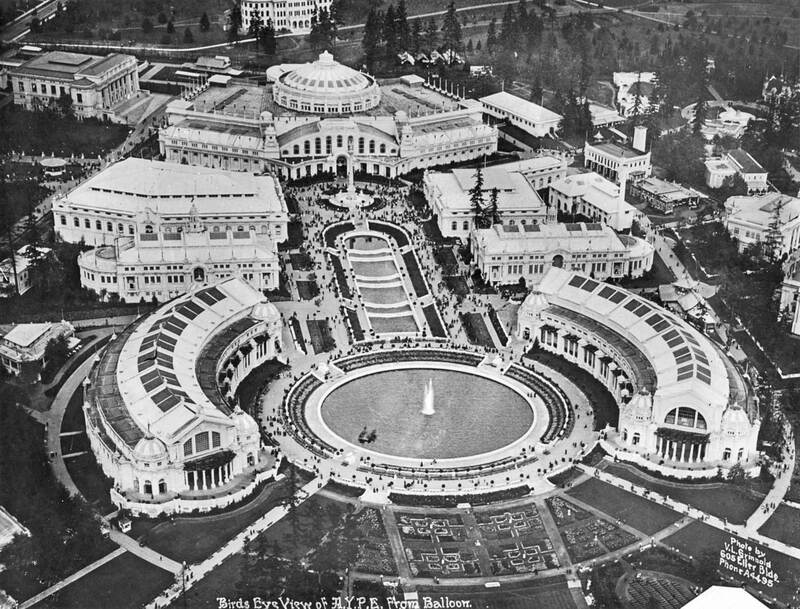 The temporary buildings were designed in a variation of what was by then typical Beau Arts exposition style: neoclassical colonnades supporting great arching roofs decorated with profuse details. 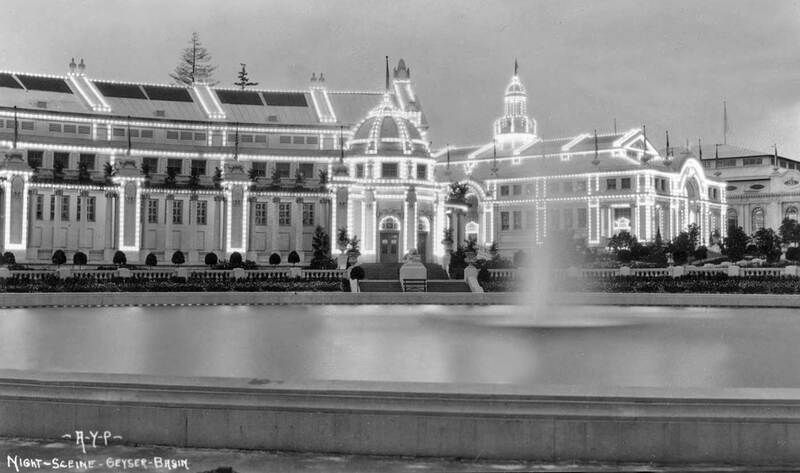 The seven buildings were named, from left, Agriculture, European, Alaska, U.S. Government (the domed centerpiece behind the fountain), Phillippines and Hawaii, Oriental and Manufacturing. Agriculture, the seventh building, is out of frame to the far left, but we have featured it with its own frame directly below the Nowell subject. Under this cosmopolitan cover was a cornucopia of mostly local enterprise combined with products from the trans-pacific region Seattle hoped to tap. 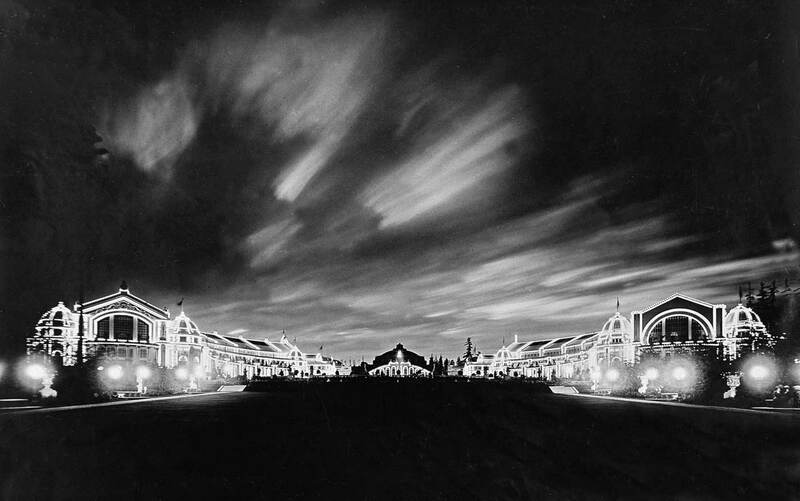 Another photo by Price, including the line-up, left to right, of the Hawaiian, European, and Oriental buildings. 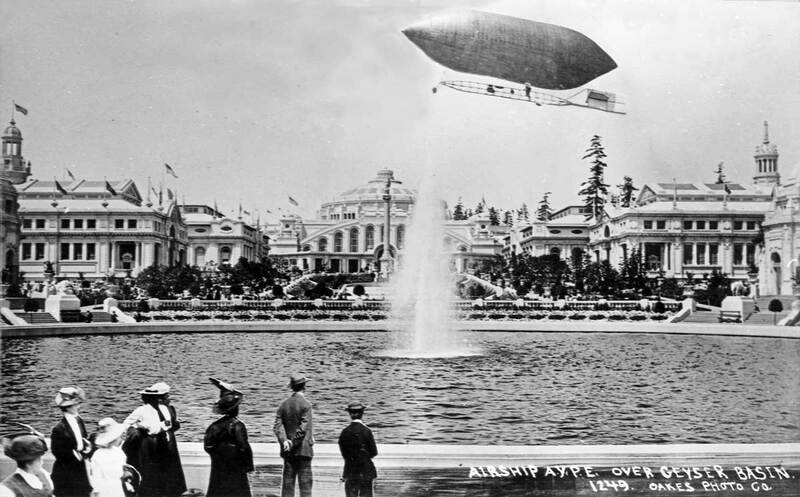 The AYP’S airship – other than its tethered balloon – is here either retouched into the scene or its admirers are folded in. The centrally placed U.S. Government Building featured at its entrance a marine hospital operating room with masked, life-size figures so real that the scene sent “shivers up the backs . . . of the bewildered visitors.” The Alaska Building, to the left of the Federal Building had a somewhat predictable display of $1 million in gold dust, nugget and bricks. Security measures for the display were advertised as much as its dollar value. The Agriculture Building is far left. Can you now name the others? Many visitors preferred to simply stroll the grounds or on clear days to just sit around and watch crowds mill about the Arctic Circle, usually in their Sunday best. 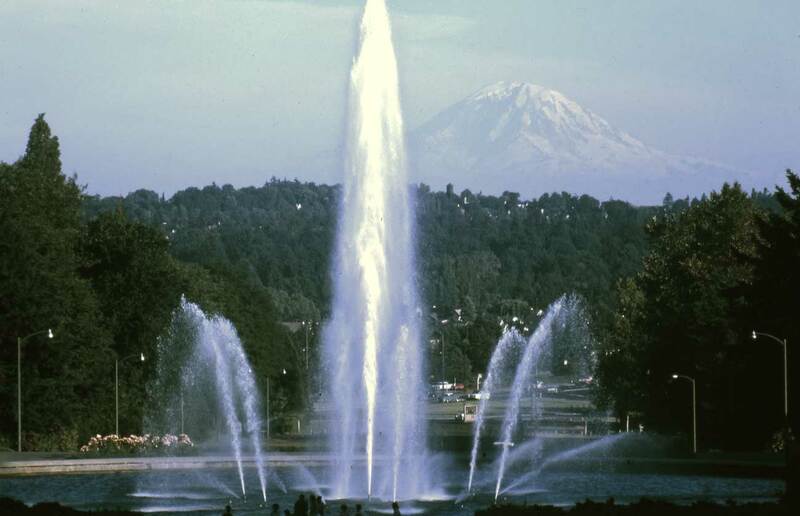 And some, like those relaxing in Nowell’s photo, would look across the formal gardens and down the Rainier Vista to what the AYP publicists promoted as “the only real mountain an exposition has ever had.” Did PR miss Mt Hood at the Lewis and Clark Expo in Portland? But the Arctic Circle was not the whole show. It was the center of elegance intended to raise the standards of popular taste. Meanwhile, the popular taste was most most likely satisfied down at the sideshow of primitives and exotic carny attractions called the “Pay Streak” where those with pop proclivities would often pay extra not to be elevated. Exposition visitors went back and forth between the crowded excitement of the Pay Streak and the meditative pace of the dazzling “white city”” that surrounded the Geyser Basin. At night this bright model of civilization instantly crystallized into the heavenly city on the hill when the elaborate covering of electric lights were turned on. 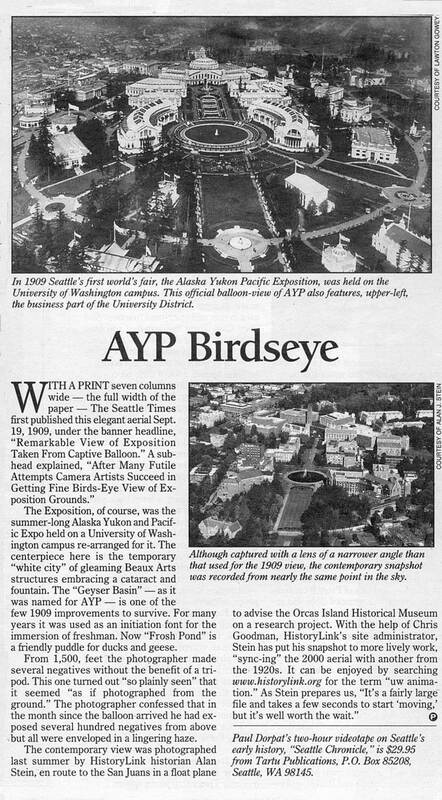 The AYP had its beginning in 1905 when Godfrey Chealander of Seattle returned home form Portland’s Lewis and Clark Exposition with his Alaska exhibit. 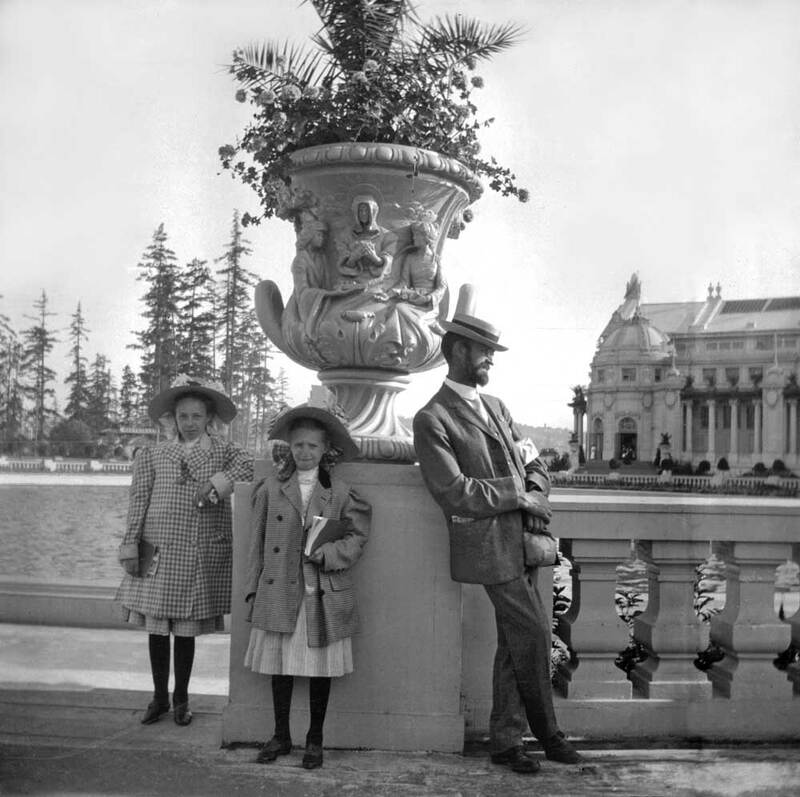 With help from then Seattle Times City Editor James Wood, Chealander’s desire turned into a 108 day affair that attracted nearly four million paid visitors. 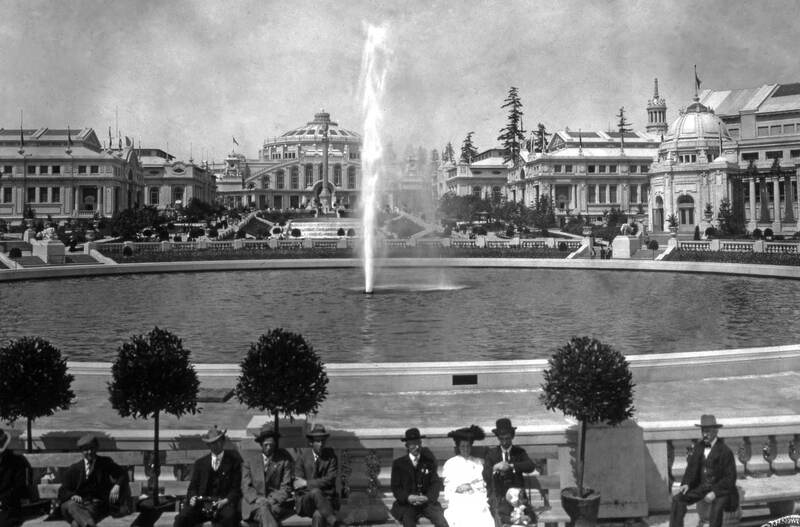 In the contemporary scene, below, the Geyser Basis in the same, but now called both the Drumheller Fountain and Frosh Pond. The temporary classical plaster of the Arctic Circle has been replaced by a more permanent brick architecture of Academic Gothic. Guggenheim Hall in 1959, and so not long since it was abandoned by its crowding neighbors, the dorms of 1946. Robert Bradley. More and more I appreciate what your work has provided. 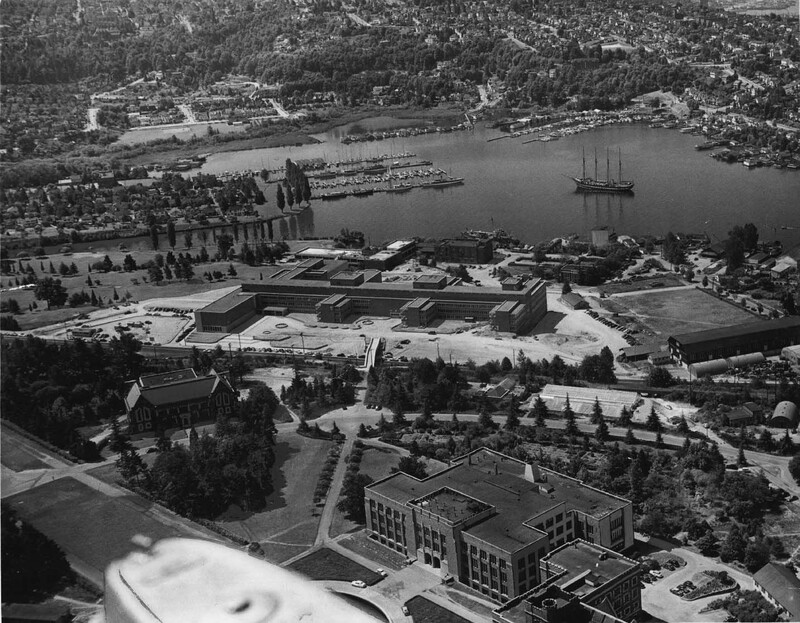 I’m writing my memoir, focused on 1946 when I was five, unaware the UW campus – shown then on your blog – existed! One day I’m showing an A-bomb image on the web of a Nagasaki elementary school, the next day a 1946 image of the UW under construction. Juxtapositions of destruction and construction does something for me, gives me hope, which I owe partly to the images in your work. Thanks. Its really mid 1921. The clue is the odd structure on the east end of husky stadium. Thats a temporary stage used in the production of the Wayfarer which was done in July of 1921. Keep up the good work. I always enjoy your information.